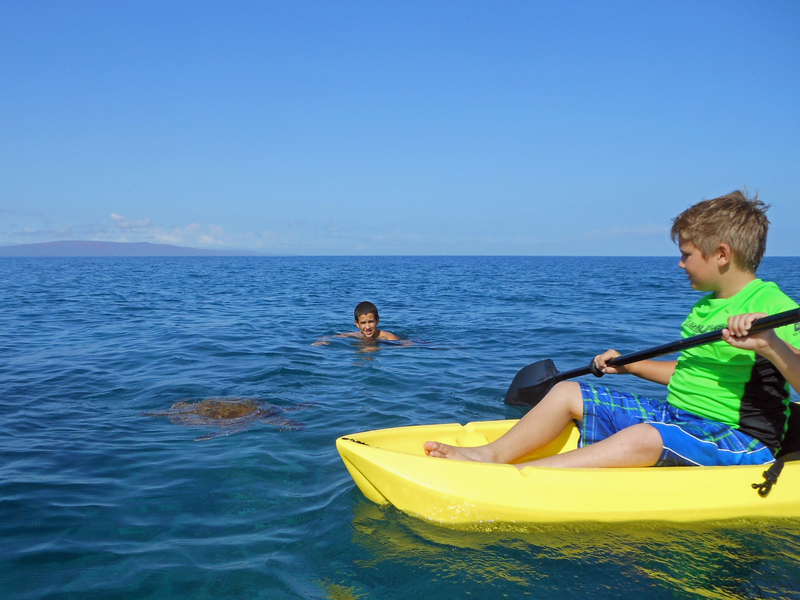 The commercial snorkeling boats don’t stop at Turtle Reef located 300-400 yards off Kalama Park in Kihei. Perhaps the water is too shallow or there is too much going on in the vicinity – like surfing and stand-up paddle boarding. 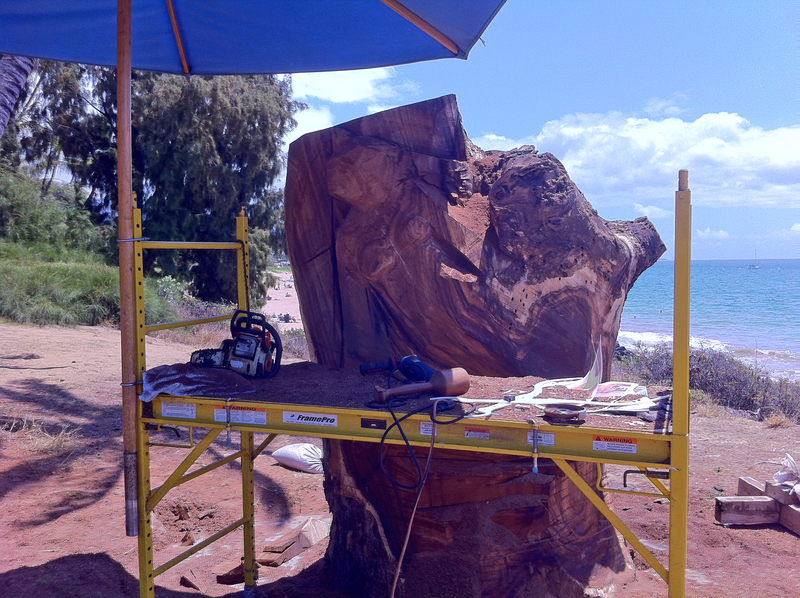 Maybe it’s too “urban.” (We’re talking south/central Kihei here, not pristine Makena landing.) For whatever reason the big boats don’t go, don’t let it stop you from visiting Turtle Reef. There are several great ways to get there. (Unless you are a VERY strong swimmer, swimming from shore isn’t one of them.) We’ve been there by stand-up paddle board and kayak. Others use a surf board. You can rent any of these from Maui Wave Riders (across the street from the south end of Kalama Park) or other nearby outfits. 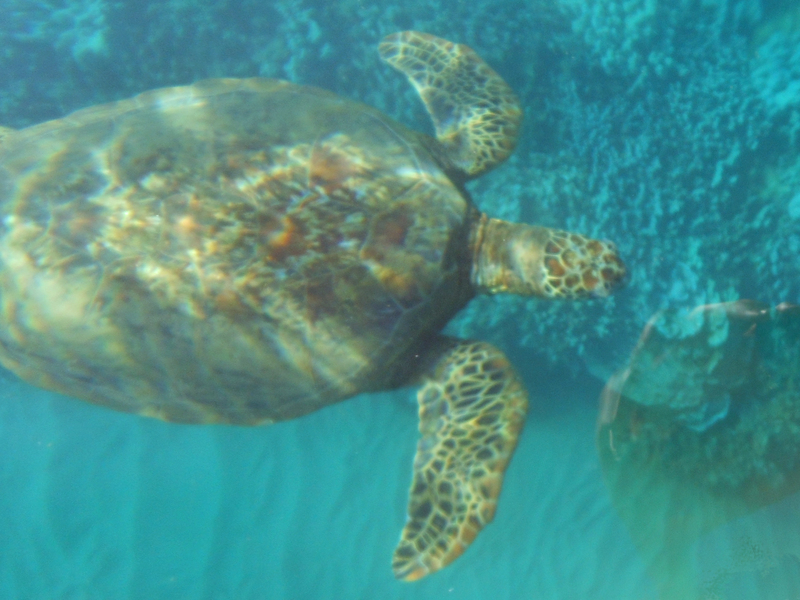 The reef is large and there are turtles everywhere – especially in the morning when the turtles like to feed and the water is calm. 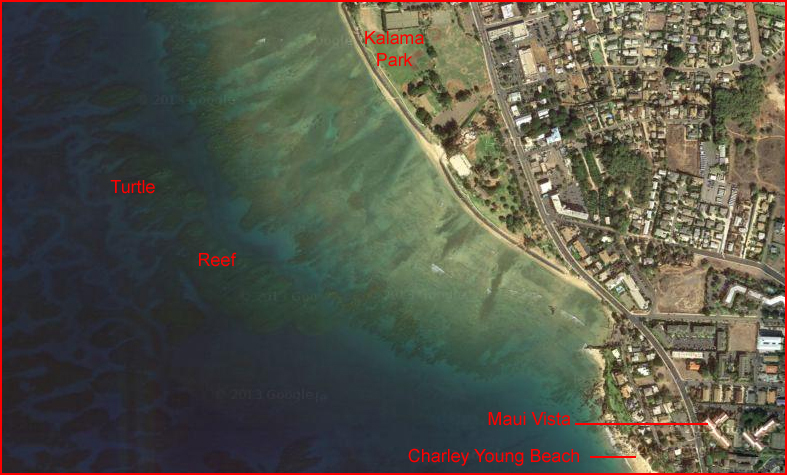 As you can see from the map, Turtle Reef is close to our condo at Maui Vista. We launched our kayak at Charley Young Beach and paddled over. If at first you don’t see turtles, keep looking. When you get in the right spot you’ll see them everywhere. I’ve counted as many at 12 turtle heads out of the water near my stand-up paddle board at a time. They get so close they may bump into you. Despite the temptation, please don’t touch the turtles – bad karma. If you like, bring snorkel gear to get an even better view! While Turtle Reef is terrific, Turtle Town is great as well. 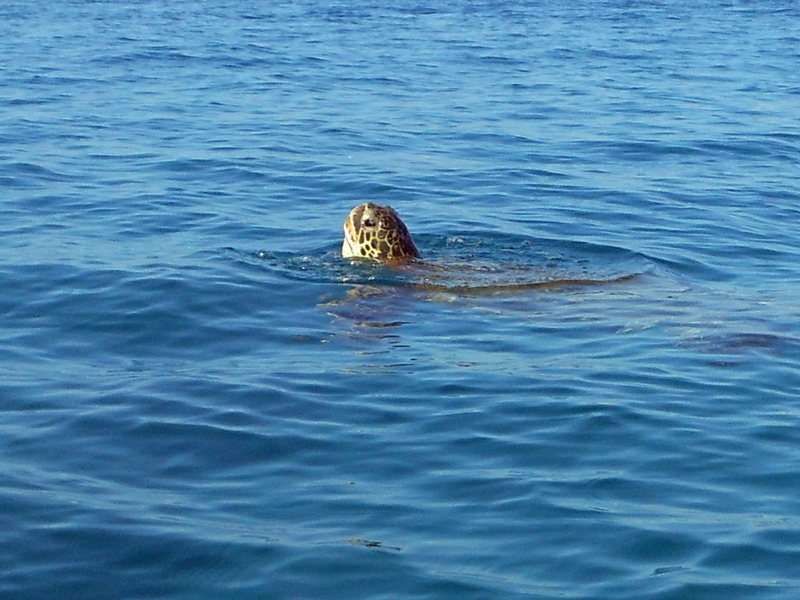 click here to see our post on Turtle Town. When to shop is just as important as where to shop. First, consider the priorities of the day. If you are planning to go to the beach, shop in the afternoon when the trade winds kick-up. However, do not shop too late in the afternoon because you will be winding your way through very crowded aisles and long lines along with the zillions of other visitors going after the evening’s food and bev. 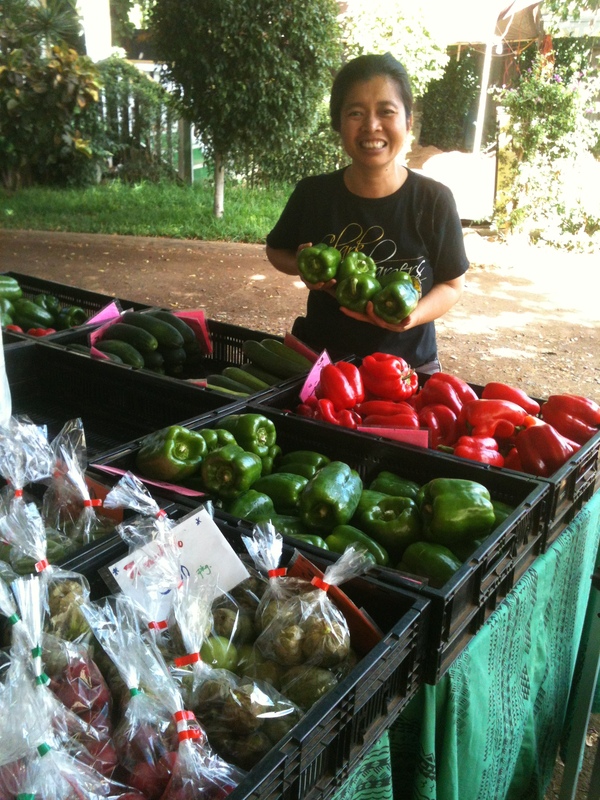 If you’re going after fresh produce, see our other blog on Rowena’s Farmers Market and go in the morning when the selection is best. In general, try to limit shopping to weekdays when the stores are less crowded. In fact, if you are going to Costco, consider going in the morning before the planes arrive from the mainland. It’s much more crowded after noon. It only takes a few times of being in a grocery store at five pm and finding the farmer’s market closed in the late afternoon to fine tune when to shop. 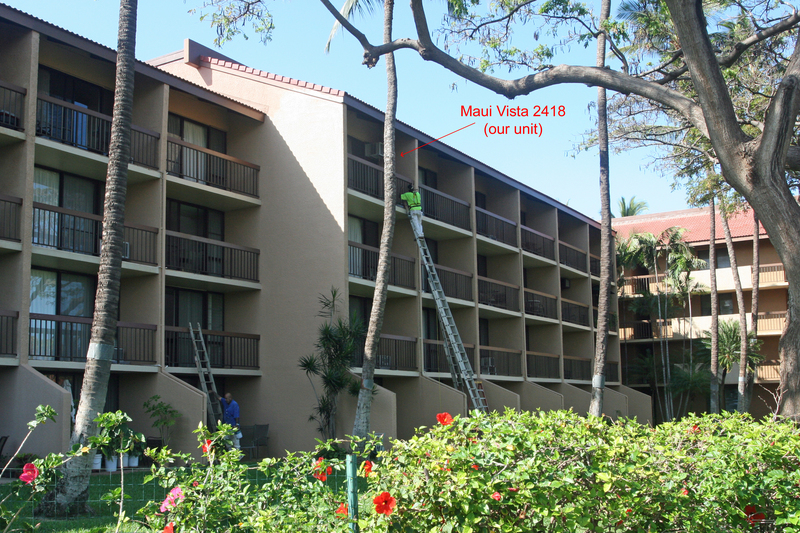 Friends and guests who have enjoyed our Maui Vista condo will be pleased to know that Building 2 is getting a new coat of paint. Yes, that’s our unit (Maui Vista 2418) with the painter at the top of the tall ladder. Remember how there’s no helmet law for motorcycles in Hawaii and how people ride around in the back of pickup trucks sitting on lawn chairs? Well, apparently, there’s no safety enforcement for people working on tall ladders either. Most of the time, the painters get from one unit to another by climbing over the railing, straddling the wall between lanais, and climbing over the railing in the adjacent unit – no safety harness required. Last year Building 1 was repainted. Next year it’s Building 3’s turn. Everything is looking fresh. 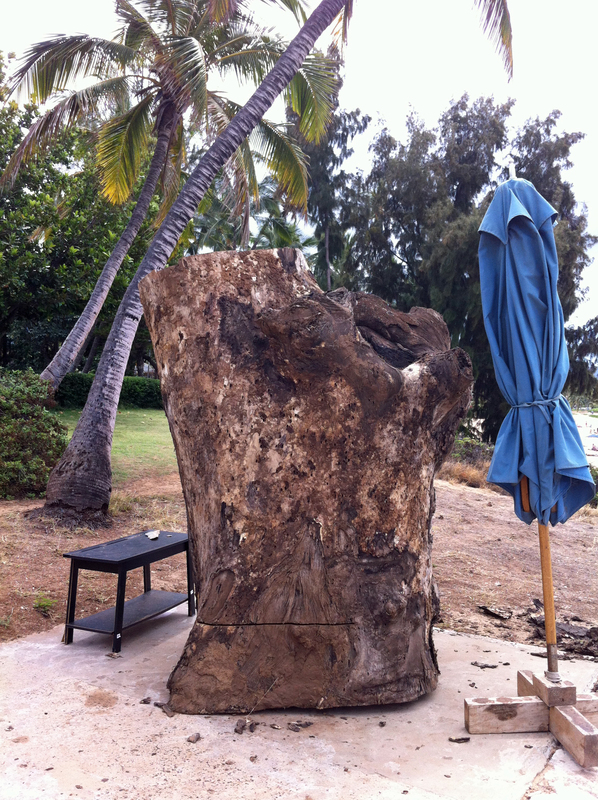 This five thousand pound stump from an old monkey pod tree sat in his outdoor studio at the north end of Charley Young Beach when we arrived in early April. By the middle of the month, the outlines of Zarrella’s latest work began to emerge. This is the chainsaw and power tool stage. Progressively finer carving tools – and ultimately – 2000 grit sandpaper are used later. By the end of April the mermaid’s form was readily apparent. In addition, large sea turtles began to appear below her body and tail. 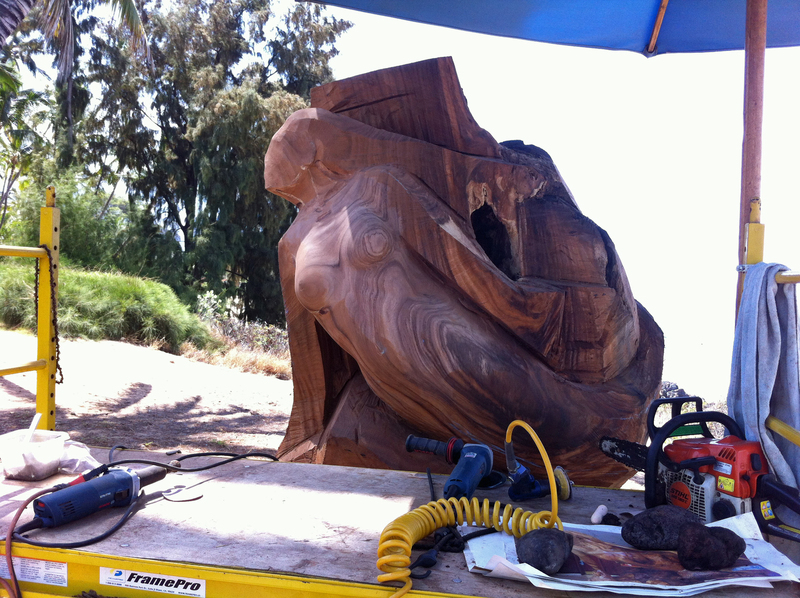 This large sculpture is the latest in a series of Mermaids Zarrella has carved. Two of his life-sized mermaids can be seen in the lobby of the Makena Golf and Beach Resort. Click here to learn about Zarrella’s artist tour that takes place every Wednesday evening at the resort. Notice the void in the stump above the mermaid’s left arm and hand. The three rocks holding down papers on the scaffold were lodged in the crevice and the tree grew around them. They must have been placed there a long time ago!